The historic day that Northern Line tube trains start running to Battersea has moved a step closer with the approval of designs for a new London Underground station at Battersea Power Station. Wandsworth Council’s planning committee has voted unanimously to green light the construction of the new tube station, which is scheduled to open to passengers in 2020. 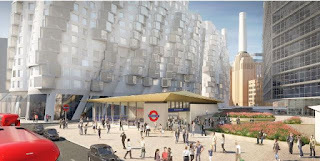 When services start it will be the borough’s first new tube station to open for 95 years. This new tube link is being funded entirely by the area’s private sector developers.